For other places with the same name, see Yorktown (disambiguation). Yorktown is a census-designated place (CDP) in York County, Virginia, United States. It is the county seat of York County,  one of the eight original shires formed in colonial Virginia in 1682. Yorktown's population was 195 as of the 2010 census, while York County's population was 66,134 in the 2011 census estimate. The town is most famous as the site of the siege and subsequent surrender of General Charles Cornwallis to General George Washington and the French Fleet during the American Revolutionary War on October 19, 1781. Although the war would last for another year, this British defeat at Yorktown effectively ended the war. Yorktown also figured prominently in the American Civil War (1861–1865), serving as a major port to supply both northern and southern towns, depending upon who held Yorktown at the time. One of Yorktown's historic sister cities is Zweibrücken in Germany, based on participation of a unit from there during the American Revolutionary War. The town reached the height of its development around 1750, when it had 250 to 300 buildings and a population of almost 2,000 people. It was the base of British General Charles Cornwallis during the 1781 siege, which was the last major battle of the American Revolutionary War. The population dropped in Yorktown and other areas of the mostly rural peninsula after the state's capital was relocated from Williamsburg to Richmond on the James River, attracting more development there. In addition, tobacco exhausted the soil, and planters shifted to mixed crops, which required less slave labor. Many generations of younger sons migrated out of the Tidewater area to new lands further west, into the Piedmont and beyond to Kentucky, Tennessee and what became the Northwest Territory. During the 1862 Peninsula Campaign of the American Civil War (1861–1865), the town was captured by the Union following the Siege and Battle of Yorktown. It was used as a base by the Union Army of the Potomac under General George B. McClellan to launch an attack on Richmond. One of Yorktown's sister cities is Zweibrücken, Germany. During the American Revolutionary War, the Royal Deux-Ponts Regiment was commanded by Comte Christian de Forbach (son of Christian IV, Count Palatine of Zweibrücken, and the deputy commander was his brother Philippe Guillaume (later renamed to Wilhelm). This was one of the four regiments that arrived at Newport, Rhode Island with Rochambeau in 1780. It participated on the side of Americans in the Battle of Yorktown in 1781. During World War I, to support Atlantic defenses, the federal government in 1918 acquired about 13,000 acres (53 km2) for development by the US Navy as Mine Depot, Yorktown. This large installation straddled York, Warwick and James City counties. It has since expanded and been developed as Naval Weapons Station Yorktown. Cheatham Annex, a facility which was developed over the former town of Penniman, is also included as part of the base. Training Center Yorktown serves as a training school for the United States Coast Guard. Also relatively close to Yorktown are Camp Peary (in York County), the Northrop Grumman Newport News Shipbuilding yards and facilities, and Fort Eustis Army base (both in Newport News). Other major installations in the area are Naval Station Norfolk, located at Norfolk, and Langley Air Force Base in Hampton. In the early 21st century, Yorktown is popular as a destination for heritage tourism. Yorktown has distinct areas. Yorktown Village or Historic Yorktown is located close to the York River, near the George P. Coleman Memorial Bridge that spans the river to Gloucester Point. Historic Yorktown is comprised first of Water Street, a small strip along the beach of the river; it contains several small restaurants, a park, a hotel, a pier, and an antiques shop. In May 2005 a building was constructed with more shops and restaurants, enhancing what is known as the "Riverwalk" section on the waterfront. Next, Main Street is located on a bluff above the floodplain. Architecture in this area is almost exclusively original to the colonial era. 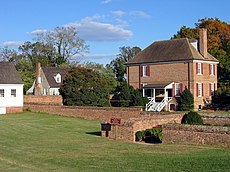 Nine buildings, including the circa-1730 Nelson House and Somerwell House (see photo), survive from the pre-Revolutionary period. The old court house, several small shops, the Nelson House, and the Yorktown Monument are located along this road. Around the center of the town are residential streets. Grace Episcopal Church, situated on Church Street near the old courthouse, is noted for its architecture. Yorktown and the nearby area are significant to the early history of the United States. Colonial National Historical Park, which contains and preserves Yorktown National Battlefield and Yorktown National Cemetery, is located on the outskirts of town. The battlefield has many of the earthworks dug by the besieging American and French forces. U.S. Route 17, also known as George Washington Memorial Highway, is the primary thoroughfare of Yorktown. It carries traffic via the George P. Coleman Memorial Bridge across the York River. York County has grown rapidly, and since the late 20th century, the stretch of U.S. 17 that passes through this area has become a heavily traveled route on which numerous strip malls and commercial areas have been developed. Many of the residential areas of York County branch off Route 17 or are near Interstate 64. Little of the recent residential or business development of York County has occurred close to Yorktown. It is being protected and managed as a historical colonial village, much like Williamsburg, under the guidance of the National Park Service. As of the census  of 2000, there were 203 people, 117 households, and 45 families residing in the CDP. The population density was 314.9 people per square mile (122.5/km2). There were 129 housing units at an average density of 200.1/sq mi (77.8/km2). The racial makeup of the CDP was 92% White, 6% Black or African American, and <1% from two or more races. There were 117 households out of which 9% had children under the age of 18 living with them, 33% were married couples living together, 7% had a female householder with no husband present, and 61% were non-families. 54% of all households were made up of individuals and 16% had someone living alone who was 65 years of age or older. The average household size was 1.7 and the average family size was 2.6. In the CDP, the population was spread out with 9% under the age of 18, 6% from 18 to 24, 29% from 25 to 44, 33% from 45 to 64, and 23% who were 65 years of age or older. The median age was 48 years. For every 100 females, there were 93.3 males. For every 100 females age 18 and over, there were 85.9 males. The median income for a household in the CDP was $30,804, and the median income for a family was $74,000. Males had a median income of $26,964 versus $16,923 for females. The per capita income for the CDP was $24,748. 0% of the population or families were below the poverty line. Federally, Yorktown is part of Virginia's 1st congressional district, represented by Republican Rob Wittman, elected in 2007. The state's senior member of the United States Senate is Democrat Mark Warner, elected in 2008. The state's junior member of the United States Senate is Democrat Tim Kaine, elected in 2012. The Governor of Virginia is Democrat Ralph Northam, elected in 2017. Yorktown's daily newspaper is the Daily Press. Other papers available to residents of the county include the Port Folio Weekly, the New Journal and Guide, and the Hampton Roads Business Journal. Hampton Roads Magazine is a bi-monthly regional magazine for Yorktown and the Hampton Roads area. Hampton Roads Times serves as an online magazine for all the Hampton Roads cities and counties. Yorktown is also served by several television stations. The Hampton Roads designated market area (DMA) is the 42nd-largest in the U.S. with 712,790 homes (0.64% of the total U.S.). The Public Broadcasting Service station is WHRO-TV 15. Yorktown residents can receive independent stations, such as WSKY broadcasting on channel 4 from the Outer Banks of North Carolina and WGBS-LD broadcasting on channel 11. Yorktown is served by Cox Cable which provides LNC 5, a local 24-hour cable news network. DirecTV and Dish Network are also popular as an alternative to cable television in Yorktown. Yorktown is served by commercial airports in Newport News and Norfolk, and by Amtrak stations in Newport News and Williamsburg. ^ James Branch Cabell, The Majors and Their Marriages, pp. 58-59. ^ Chisholm, Hugh, ed. (1911). "Yorktown" . Encyclopædia Britannica. 28 (11th ed.). Cambridge University Press. p. 936. ^ "Genealogy of the Page Family in Virginia". ^ This story was written Mark O. Piggott, Naval Weapons Station Yorktown Public Affairs. "Naval Weapons Station Yorktown Celebrates 90 Years of Ordnance Support". 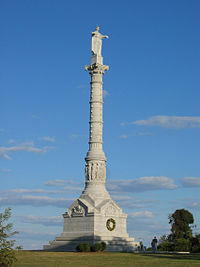 ^ "Yorktown Victory Monument, (sculpture)". ^ "French Army Casualties at Yorkown". ^ Holmes, Gary. " Nielsen Reports 1.1% increase in U.S. Television Households for the 2006-2007 Season Archived July 5, 2009, at the Wayback Machine." Nielsen Media Research. September 23, 2006. Retrieved on September 28, 2007.